28 sept: SATELLIETGROEP @ INTERFERENCE: EVILUTION? Eliane Bots, filmmaker en co-curator van Satellietgroep stelde voor het 'Interfence: Evilution?' Festival in Breda het speciale filmprogrammaover evolutie van het kustlandschap samen. Het programma start met haar korte introductie en uitleg over de keuze van de films, gevolgd door een toelichting op het openingswerk 'Sinking into the landscape' door ontwerper Francois Lombarts. Francois zwom tijdens het project 'Stellingname' door de sloten en greppels om de polder te begrijpen. 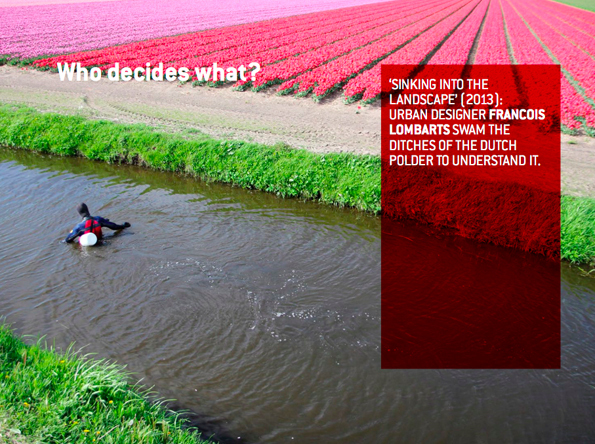 'Sinking into the Landscape' by Francois Lombarts is a voyage through the water of all the the canals, ditches and trenches of the Haarlemmermeer polder. By visualizing the physical experience of the polder it is an attempt to understand the idea of being below the sea level submerged in a water landscape. ‘Deluge’ is an almost-forgotten early American disaster movie. For decades, it was thought that all prints had been lost, but an export version, dubbed into Italian and shortened by ten minutes, was found in the 1980s. This video shows only the disaster -the unexplained destruction of New York (and the rest of the world) by earthquake and flood- itself. A gigantic model of lower Manhattan was built, with breakaway buildings shaken to pieces and then washed away by thousands of gallons of water from dump tanks. 'Little Dubai' gives a humorous insight in the new architectural developments of Batumi, Georgia and focusses on how Batumi as a city presents and profiles itself. The wind roars. The sea crashes against the cliff. Two meters of rock, that is the strip of water and oxygen where the goose barnacle grows. Two meters where the sea shows no mercy, and beats with millenary strength. A line of waves and foam where Serxo and his comrades fight for a bite out of the sea. A line between bravery and fear. Between recklessness and common sense. Two meters without margin of error. That is where the barnacles live. Where Serxo lives. SEA BITES is the battle against the sea from some warriors that don't consider themselves heroes. Dr. Steve Palumbi shows how the increase of CO2 in the waters of the ocean may affect certain types of sea life. This dramatic view explains that if the level of CO2 continues to rise in the ocean, many creatures that have calcium-based shells may not be able to survive at all. “The Acid Ocean” is part of a series of videos on the oceans. 7. 'The wishing well', Sylvie Zijlmans, 3 min. St. Kilda, off the west coast of Scotland, is the most remote archipelago of Great Britain, with the tallest cliffs. This group of islands is still known for its large populations of puffins and gannets. For centuries, a small community was able to survive here on a few square kilometers, practically isolated from the outside world. But the last islanders were evacuated in 1930. The only two survivors of this period are old now and quite unapproachable. St. Kilda is a film about rituals, birds, bold ventures by bachelors, and big toes. The narrator of the film, who is reciting his own dream, has been plagued with dreams of tidal waves before he was old enough to know what one was, or ever saw the ocean. A fisherman who sketches to pass the time on the vast sea encounters a surreal and fragile two-dimensional world, which seems to have sprung forth from his drawings, and is guarded by a tribe of stiltwalkers. "What is today, is not what it was yesterday nor what it will be tomorrow." In this sentence, the despair and the resignation of the ex-fishers of Muynaq, a little city on those being the coast of Aral Sea. The city, being a ghost one by now, and its inhabitants are the victims of an unstoppable environmental disaster, going on since decades. You can also contribute to the activities of Satellietgroep! Spread the word or invite us for a presentation, research, collaboration or exchange project. Feel free to contact us at info@satellietgroep.nl or browse our website www.satellietgroep.nl for ideas. Jacqueline Heerema, Eliane Esther Bots and Ronald Boer, on behalf of the Satellietgroep Foundation. Projects of Satellietgroep are supported by ECF, the municipality of The Hague, Haagse Brug, Stroom, Mondriaan Foundation, the municipality of Haarlemmermeer. Satellietgroep works also on commissions. Vanaf 2006 zet Stichting Satellietgroep zich in op de ontwikkeling van de kwaliteit en zichtbaarheid van cultuur in een veranderend zee- en kustlandschap. We beogen daarbij een nieuwe benadering van de relatie tussen kunsten en erfgoed, namelijk die van innoverend erfgoed. Dit manifesteert zich door cultuur midden in actuele vraagstukken over kusttransities te positioneren. Daarmee draagt Satellietgroep bij aan het leren begrijpen van dit specifieke Nederlandse kustlandschap. Hierbij speelt de opeenstapeling van meerdere vakdisciplines een belangrijke rol. Vanuit verschillende gezichtsvelden wordt het Nederlandse kustlandschap voor een breed publiek als innoverend erfgoed zichtbaar en beleefbaar gemaakt. Dit gebeurt op niet geïnstitutionaliseerd wijze, dus niet binnen de muren van een museum of op een sokkel, maar als organisch internationaal netwerk dat kuststeden en -gebieden verbindt. Door het activeren van participatieve gemeenschappen worden nieuwe methodes en werken ontwikkeld die zorgen voor een andere collectievorming en –ontsluiting. Satellietgroep explores through arts and culture how the sea and waterways influence cities, people, communities and environments. Our aim is to enhance public and professional awareness on coastal transitions. Satellietgroep programs Badgast since 2009 for exchange of local knowledge on a global level. Badgast is a research based artist in residence program, outdoor Cinema with screenings and Talks, all concerning the sea and waterways. Badgast is located in the middle of the surfing village FAST, the Urban Beach Community at the hinge point of the boulevard and harbour in The Hague at Scheveningen. In 2012 we started the international exchange project 'Now Wakes The Started' (NWTS). We invite international artists and scientists to jointly develop and present research articulating a cultural, innovative and sustainable significance of the sea and its coasts by doing on-site research, engage with local communities, collaborate with local experts and connect to international networks. During these residency periods new works – both conceptual and documentary - are developed that reflect upon the complex and layered coastal transitions and urban developments. With these works they contribute to the international contemporary collection on coastal transitions of Satellietgroep to be shared with broader general and professional audiences. We interconnect coastal communities by connecting contemporary research and new works to historic and future coastal developments.